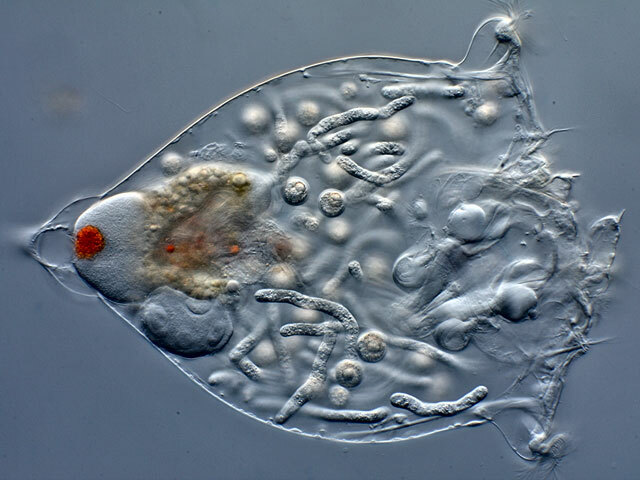 The coexistence of two species of organisms, in which one species (parasite) damages the other species (the host), is called parasitism. 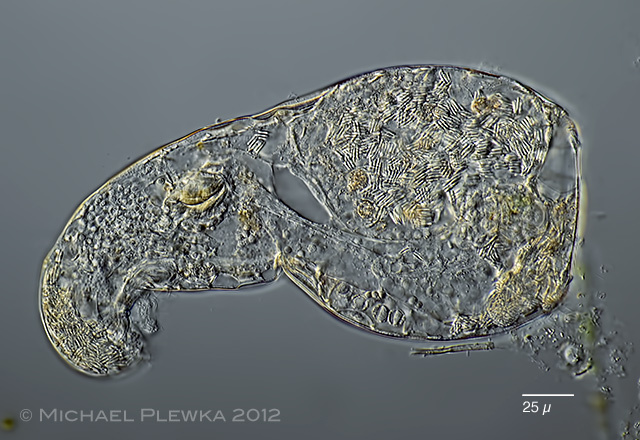 Many rotifer species can be infested by parasites, but there are other rotifer species that are parasites by themselves. 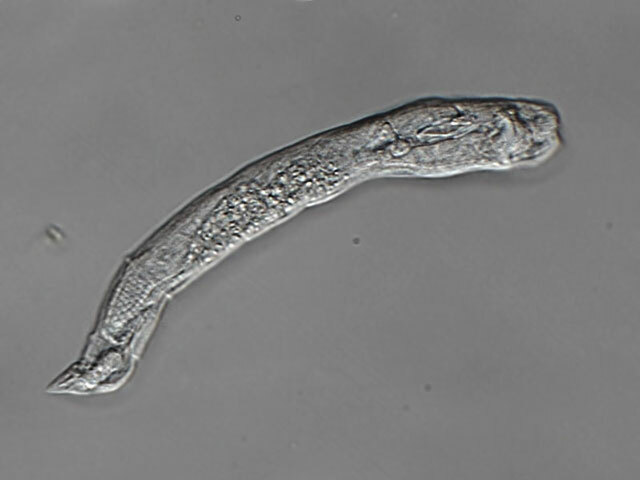 Often this biotic relationship leads to death of the host in the medium term. 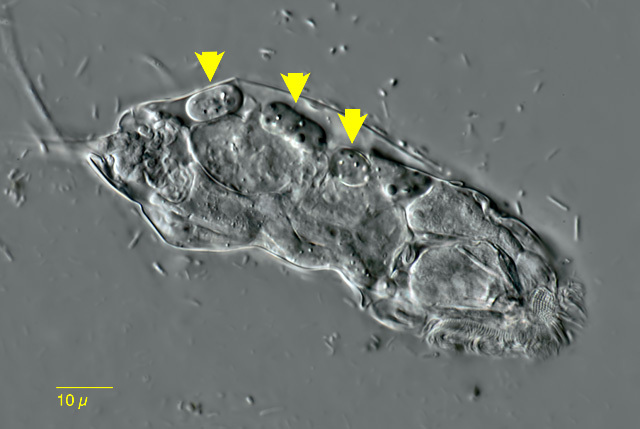 Therefore, the life cycle of the parasite is often associated with a host change, especially if the parasite lives inside the host (endoparasite). 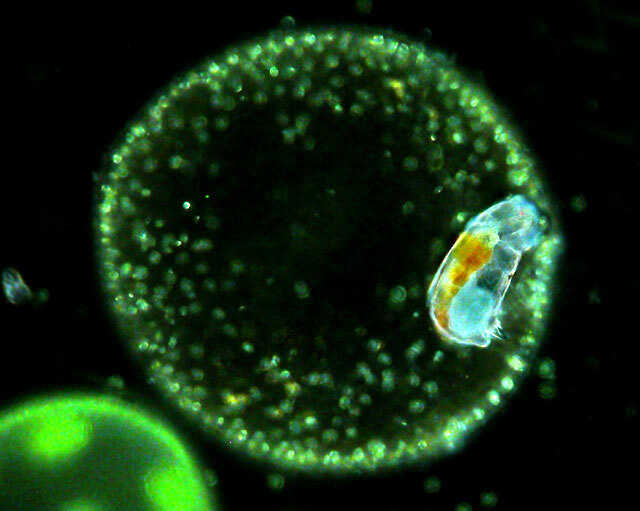 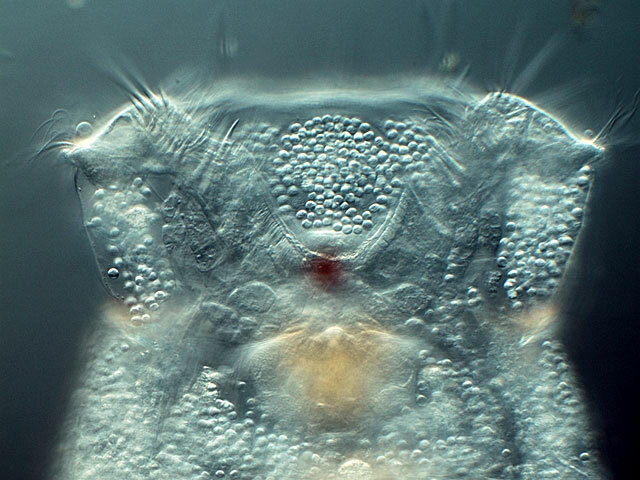 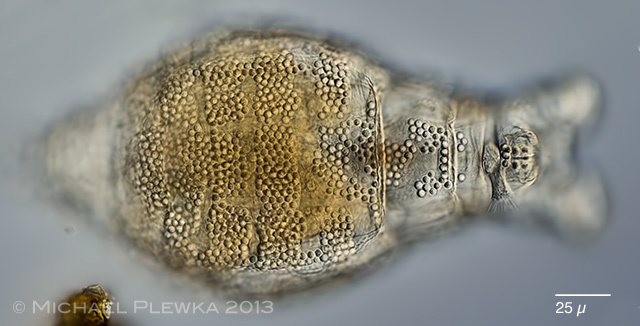 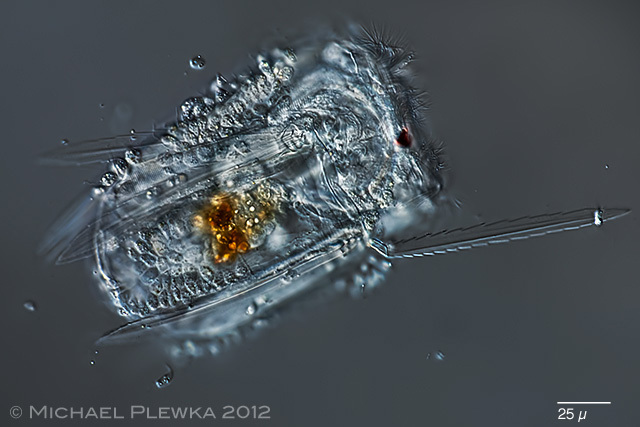 In rotifers you can sometimes find foreign bodies in the body cavity or on the organs. 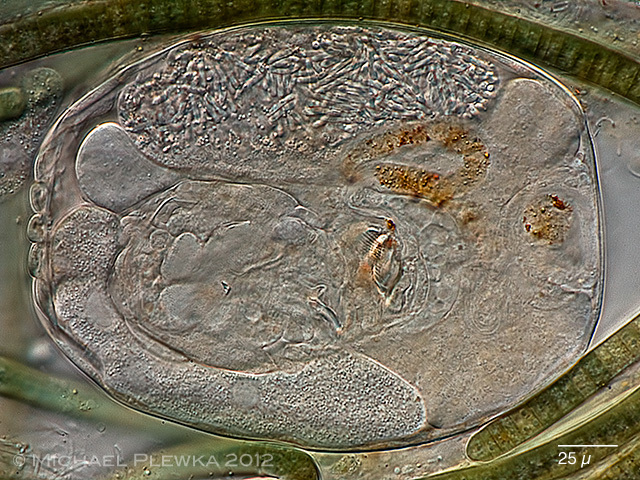 It seems likely that these are (developmental stages of) parasites. 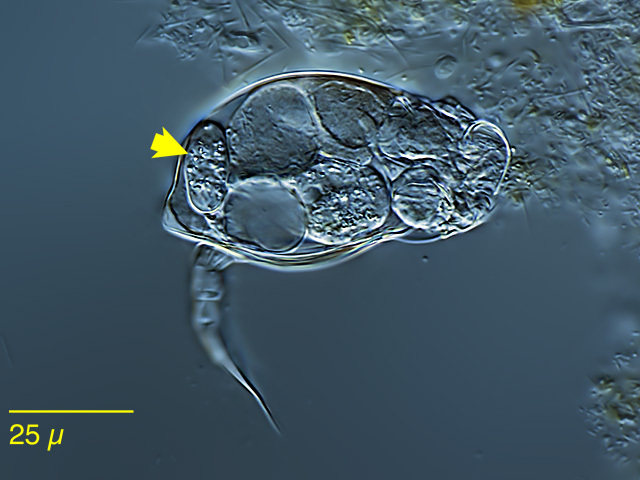 The taxonomic classification, especially based on morphological traits, biology and ecology of these parasites is unclear in many cases. 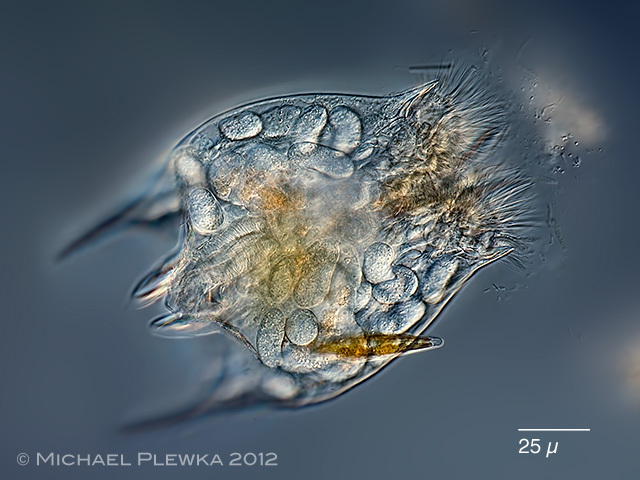 Several species of rotifers with parasites have been observed. 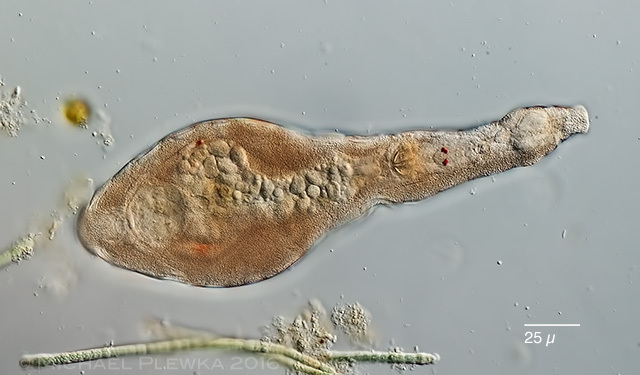 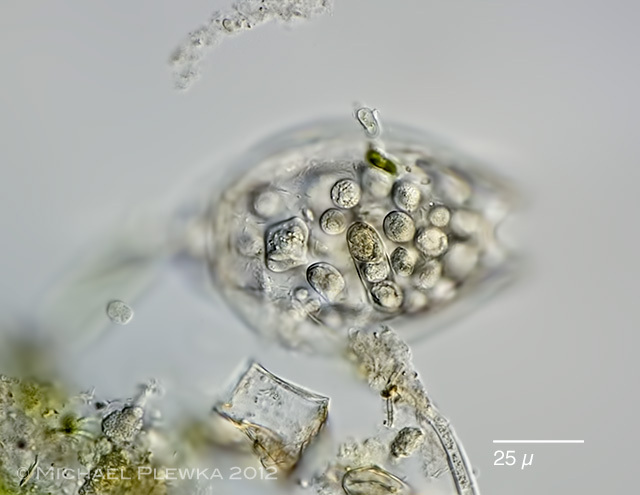 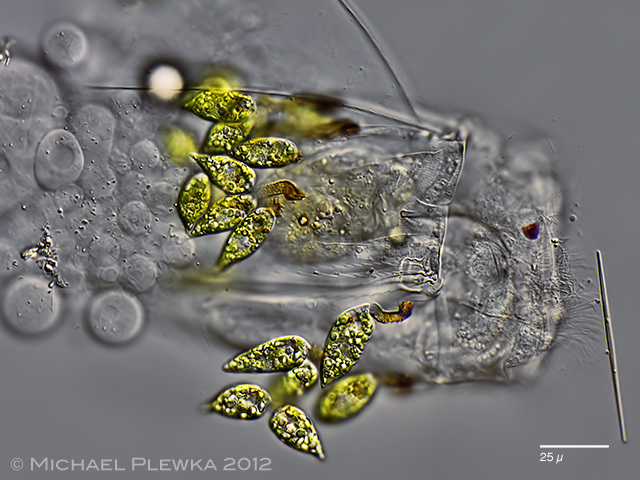 Some bdelloid rotifer species are living in the cells of Sphagnum moss. 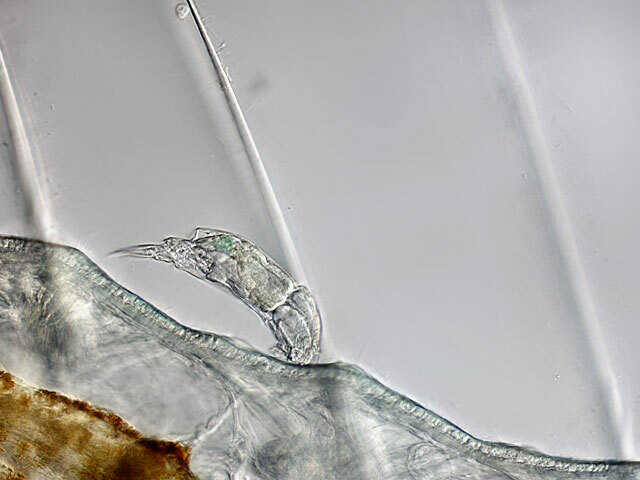 For instance Habrotrocha roeperi which is in the above image lives in the retort cells, whereas Habrotracha reclusa lives in the hyalocytes. 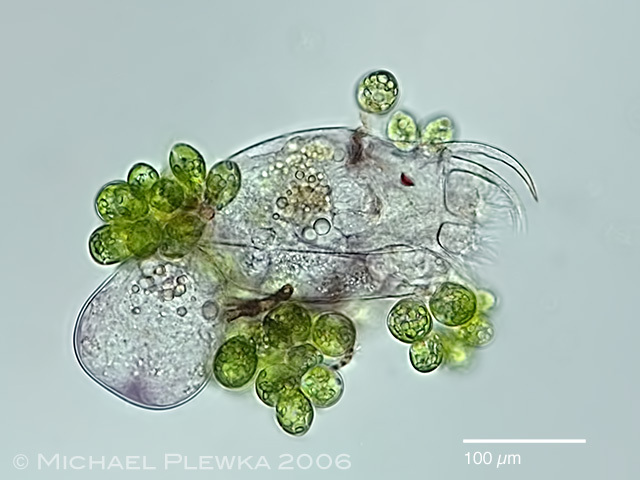 Some authors consider this behavior as space parasitism, as well as the behavior of the Bdelloid Mniobia symbiotica, which lives in the lobules of the liverwort Frullania. 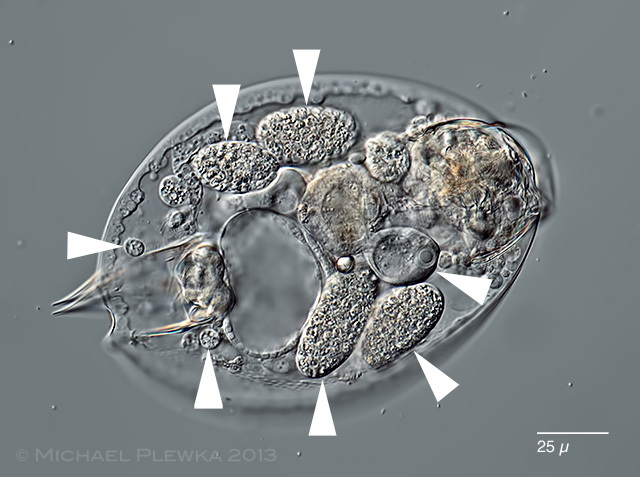 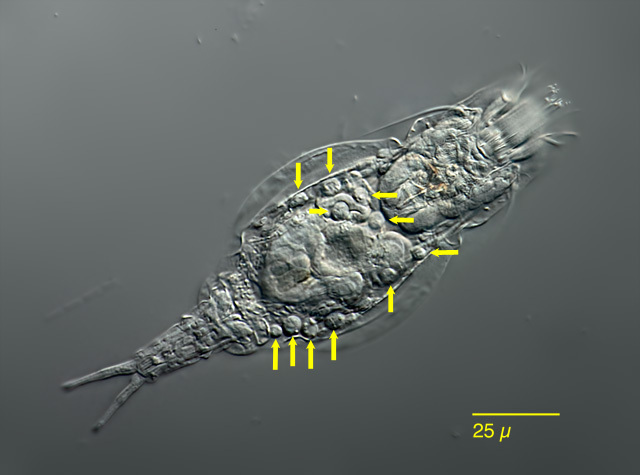 Both taxonomic groups of freshwater rotifers, the Monogononta and the Bdelloids may be infested by parasites. 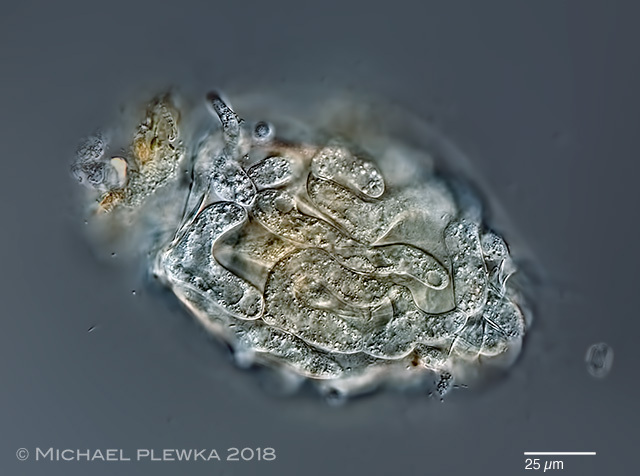 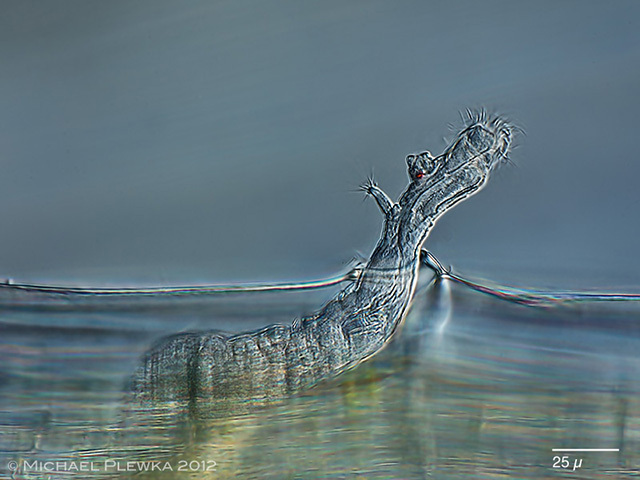 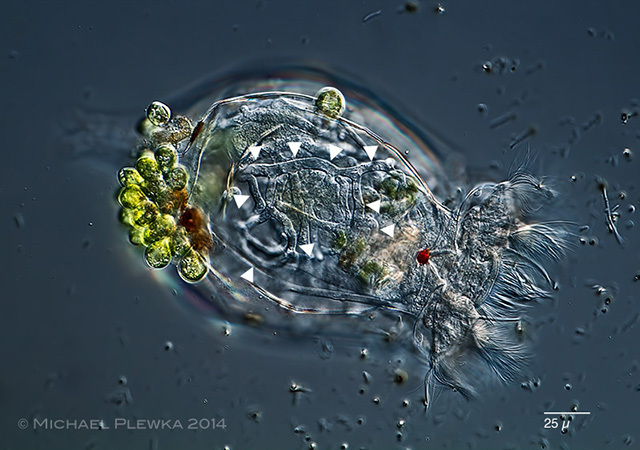 While the monogonont rotifers have the chance to escape in the liquid water body of ponds and lakes the bdelloid rotifers, most of which live a thin film of water in mosses or soil have a different strategy: it seems that they can escape by desiccation. 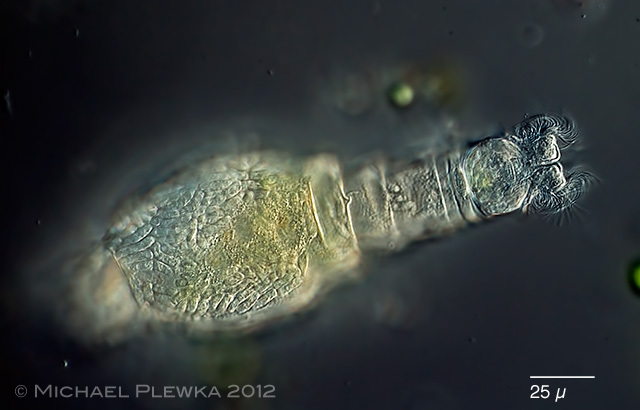 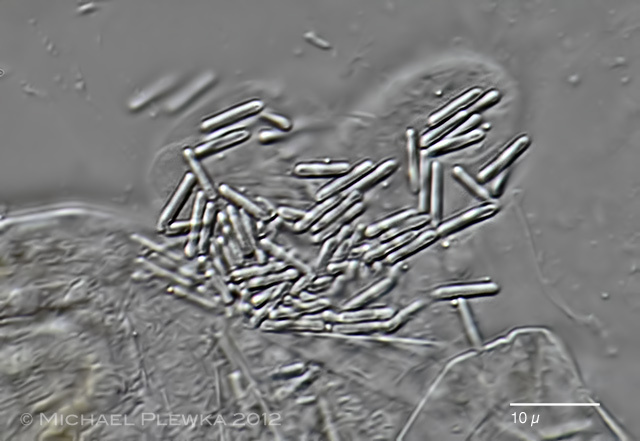 Polyarthra vulgaris covered with euglenid flagellates Colacium sp., which may be considered as ectoparasites. 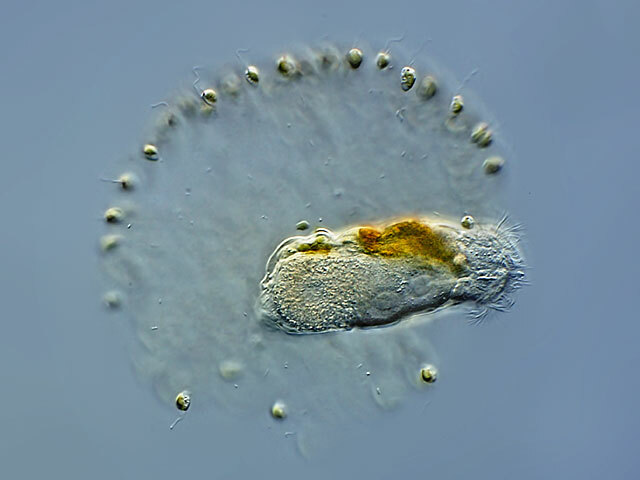 Polyarthra vulgaris covered with zooflagellates, which may be considered as ectoparasites.